Judgement Highlights in the Carmichael Case. So, the case is over and the judgement delivered. Mr Carmichael has won – he is still an MP but he is now disgraced by how the judges have talked about him. We had to win three specific points – and all of them to be successful. c) and that it was to effect the results of the local election. In effect, there is a fourth point, that he did not have reasonable grounds for believing the statement to be be true. The only point we lost was on was b. That he behaved in a way that is shameless throughout the process and only revealed information as he was compelled to is not sufficient grounds for the election to be void. This is the official statement from the Courts on what happened today!!! A petition challenging the election of Alistair Carmichael as Liberal Democrat MP for Orkney and Shetland has been refused after judges ruled it had not been proved beyond reasonable doubt that he had committed an “illegal practice”. Following an evidential hearing in proceedings brought by a number of constituents, the Election Court held that Mr Carmichael was duly elected and that his election was not void in terms of section 106 of the Representation of the People Act 1983. Lady Paton and Lord Matthews had previously ruled that “a false statement by a candidate about his own personal character or conduct made before or during an election for the purpose of affecting his return at the election has the effect of engaging section 106” of the 1983 Act, but ordered that evidence be led to assist in the resolution of the two remaining issues, namely: did the words complained of in the petition amount to “false statements of fact…in relation to the personal character or conduct” of the first respondent? ; and were the words complained of uttered “for the purpose of affecting the return of any candidate at the election”? On the first issue, the court observed that the first respondent [Mr Carmichael] had told a “blatant lie” when, in the course of a Channel 4 interview on Sunday 5 April 2015, he claimed that he had only become aware when contacted by a journalist of a memo leaked to the press by his special adviser Euan Roddin, which stated that First Minister and leader of the SNP Nicola Sturgeon had told the French ambassador that “she’d rather see David Cameron remain as PM”. However, on the matter of whether the lie could properly be characterised as a false statement of fact “in relation to [his] personal character or conduct”, the judges were left with a reasonable doubt. “It is of the essence of section 106 that it does not apply to lies in general: it applies only to lies in relation to the personal character or conduct of a candidate made before or during an election for the purpose of affecting that candidate’s return,” Lady Paton said. The judges gave some examples of what might be regarded as false statements of fact in relation to personal character or conduct. That conclusion was sufficient for the resolution of the case, but for completeness the court gave its views on other matters. On the second issue, the judges were satisfied that it had been proved beyond reasonable doubt that the first respondent made the false statement of fact “for the purpose of affecting (positively) his own return at the election”. Furthermore, the judges considered that the evidence established that there was another purpose underlying the false statement, namely a desire not to be identified as being involved in the leak. Alistair Carmichael on the Stand – where we are with the case now – update from the Vole! The trial has happened. You made it possible. Thank you. The Rt Honourable Alistair Carmichael MP (still) has been called down from his dizzying heights and been made to stand before two judges and explain his conduct. Now, we wait for the judges – the case will be decided on the law and not the politics – and they need to take their time. The process took three days – the Court had set aside four. The first two were taken up by evidence. Our side went first. 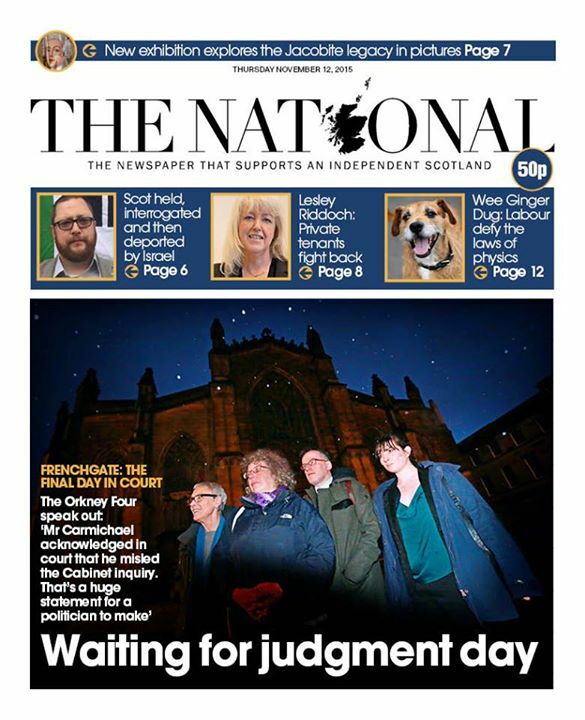 Fiona Grahame (one of the four petitioners) spoke on behalf of all of us and was brilliant. She demonstrated that far from being a nationalist conspirator, she is a calm, clear and moderate woman who cares deeply about democracy. 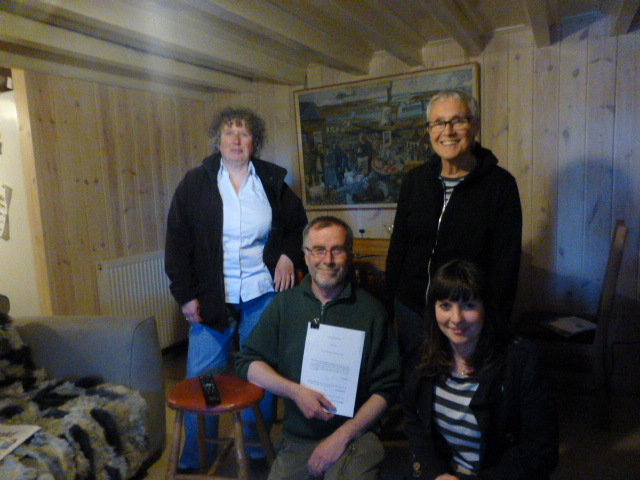 Orkney Voles against Carmichael – campaign update!!! The decision of the Electoral Court in the ‘People versus Carmichael’ case was published today. The judges have agreed that Mr. Carmichael’s behaviour may be covered by electoral law and have dismissed most of the arguments raised in his defence. So, thanks to you, the law is being clarified – and this is a real victory – candidates can no longer make false statements about themselves at a General Election – they must tell the truth. The judges now want to hear evidence about the nature, purpose, and context of Mr. Carmichael’s lies and this will probably involve him having to testify on oath. Judge in the Court of Session sets dates for the process against Alistair Carmichael MP. We hope he resigns before proceedings come to Court. The case bought by 4 Orkney constituents against their MP, ‘ the People versus Carmichael’ has got its dates set by the Court of Session. The trial will take place in Edinburgh on the 7th and 8th of September and will initially focus on points of law that can only be determined by the judges of the Electoral Court. Both sides need to lodge papers outlining their argument in advance. The case is funded by contributions made by 3,973 individuals who have given an incredible £61,503 to the campaign through the crowdfunding website Indiegogo. People can still contribute and any excess funds that we raise will go to the food banks made necessary by the policies of the Coalition Government. ‘We are not allowed to comment on the merits of the case whilst it is before the courts. We are very glad that dates have been set so that we have a clear idea of what is going to happen. We are particularly pleased that attempts are being made to stream the proceedings live to Orkney and Shetland so that justice will be done in public with us, his constituents, able to see what is happening. 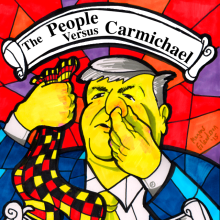 First Hearing on the People versus Carmichael this Thursday! The people behind the crowdfunding campaign for the legal case to hold Orkney and Shetland MP Alistair Carmichael accountable for his behaviour before, during and after the 2015 General Election campaign have thanked the thousands of donors who helped surpass the £60,000 target. A total of £61,448 was donated over the month that The People Versus Carmichael fundraiser was on Indiegogo. Representing 102% of the target, the cash came from 3,968 individuals – averaging approximately £15.50 each. Amber Rudd, your policies are racist. Orkney Voles fear deportation lists. Orkney Voles concealing their foreign origins to avoid deportation. Former UK Prime Minister David Cameron stands down as an MP, triggering a by-election in his Oxfordshire seat of Witney. It made Mrs Vole happy and all the little new voles too. This has to be the first time that David Cameron ever made me happy. AS Westminster votes to put the lives of all of Scotland at risk from nuclear accident – read this review of William Perry’s autobiography. This man who was US Secretary for Defence could not be more about the stupidity of nuclear weapons. He argues that we have survived so far by accident. Mrs Vole says that this article is the kind of reason the Internet is not good – it is just bad for the nerves, especially at breakfast. On this anniversary of the Somme. We will not allow politicians divide Europe and let slaughter happen again. On this anniversary of the Somme. We will not let Michael Gove and Nigel Farage divide Europe and create an atmosphere where this can happen again. We were betrayed then by a bankrupt political class and they are doing ti again, before our eyes, these cold eyed bastards, these evil men who conflate their own ambitions with what is good for all us. Curse them all. 20,000 people died in one day – almost the current population of Orkney. What this country is like is not up to these fools and idiots who govern from Westminster. It is up to us now. We are the people who really determine matters. If we offer a cup of tea, the country becomes friendly; a bed for the night, it becomes hospitable. Every part of me wants Scottish Independence, more than ever. BUT I have lived in England for a long time. I have family, lovers, colleagues, decent people. I will not abandon them to the far right and to Fascism – and make no mistake, the Fascists are back and their fellow travellers. How we enable them to come here and be safe matters. We created a Scottish Independence movement that is supported by the new Scots who have come here from England. We must go further. I don’t know how yet, but we must think about it on this anniversary of a day when 20,0000 people died. Come all ye at home with Freedom. Our English comrades are afraid and they need to know we will welcome them here with open arms. 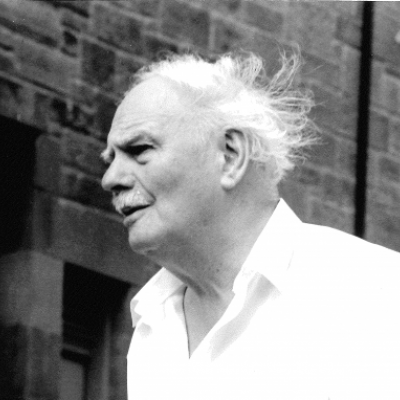 Remembering the horrors of poverty and fascism Hamish Henderson wrote the great anthem of Scottish freedom – an anthem that combined the hopes of international socialism with the vision of independence. The song commemorates John McLean, the great hero, who was imprisoned in the dungeons of Edinburgh Castle during WW1 and died as a result of the TB he contracted there, made worse by his giving his coat to a man who did not have one. Rough the winds in the clear day’s dawning. Through the great glen of the world today. There is a rough wind blowing across the glens. If you believe in freedom, you are welcome here and we will do what we can to give you homes and food. We were in an Empire that divided the world and now we want to be part of the healing – all races, especially those that cursed us, welcome. I am hit by the sheer terror that seems to be hitting my friends in England – the liberal, decent people I worked and lived beside for over 20 years – these people are mostly professionals with left wing attitudes, lots of education and huge amounts of skills. All are horrified. I have never known people talk about exit plans and they seem very afraid. I would like to say that this fear is groundless but with what we have seen happen in our lifetimes, we cannot say that. We have all watched stable democracies, united countries descend into levels of economic anguish and violence that we would have thought impossible. Because of the census, they now know religions and sexuality, ethnicity, all that bastards need to be able to purge and remove. The abdication of leadership in the English political parties is astonishing. The big parties of Government are in disarray – only the right and far right seems capable of functioning at the moment – it is hard to believe they would not storm home in any election — and in England there is a state that has incomparable data on its citizens and without the discipline of the European courts, can do anything it likes. Scotland is clear it wants to stay in the European Union – it seems inconceivable to me that they would not take us; we share the values, the beliefs and we want to be in it. Yesterday, many, many of my colleagues in IndyRef reported the same phenomenon; ardent unionists coming up and saying that we have no choice but the SNP now. Good. Now, lets get this country sorted! There is no shame in people changing their minds when the world has altered. The deal we were offered in 2014, to be an autonomous part of a UK within the EU, is dead. The choice is clear – rule from a resurgent right wing OR to be part of the progressive democracies of Europe. It is one or the other – it cannot be both. So, no contest. We have to be clear to our comrades in England and Wales that we will welcome them – not out of charity but because the ones who are in grief now are the best and the brightest. They will take with them their skills, their resources, their openness – these values, wealth and expertise that we need to be strong in the new Europe, whatever shape it takes. Here, in the islands in particular, we have the space – our population is a fraction of what it was a hundred years ago. We have the land, buildings that can be rebuilt, hearth stones that can see fire again. People are starting to use poly tunnels to make land fertile again – the information technology that means networking and distance working is possible. The infrastructure collapses and we just start growing more potatoes, neeps and carrots, not exciting but we will get by. Above all, we have peace and safety – this we have to share now. None of this can or will be easy but we can do the nation building again – become something positive and wonderful. Lots of people are writing about how to get a Scottish passport. Well, there is no such thing. We use the same EU passports as everyone else and are as committed to the free movement of peoples as the rest of the European Union. in the referendums on our future since 1997, the voting criteria has been that all European Union citizens had a say, and this was extended to those above 16. In 2014, it was clear that everyone who was on the voting role could become a citizen. I see no reason to think that anything would be different now. To be part of Scotland’s future, we don’t care about who your grandparents were, but about you, and that you are prepared to make the commitment to the country to live here. Nicola Sturgeon’s decision to forswear political opportunism and campaign for remaining in the European Union has been vindicated by the horror show taking place south of the border. Never has the gulf in political culture between Scotland and England been so wide as in the past week, as the row over immigration overwhelmed the EU debate – complete with overtly racist imagery in the infamous Brexit poster. And lest anyone claim this is in itself a racialist comment on the character of English people let me say right away there is nothing in the Scots’ DNA that immunises them from racial intolerance. Indeed, there is evidence the very absence of black and brown faces in Scotland has led to some prejudicial sentiments going unchallenged in the past. 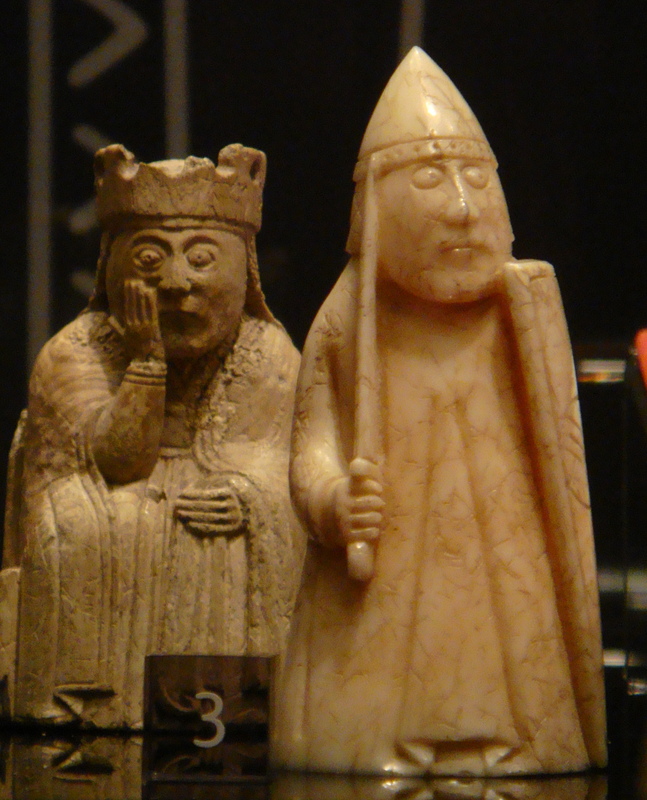 No – it is not the English are different, it is that Scottish politics and history are different. In mourning for Britain. Woe upon us. Help us Europe. Many of us thought this would happen – that the only way we could ensure staying in Europe was to vote independence. This was the huge scare that was held over our heads. This is the worst day I have seen in politics. We have seen reckless people destroy our democracy. A minority have threatened the peace of Europe – the consensus that kept that the far-right under control is now gone – all over the Continent the neofascists will be looking out of their rat-holes and pushing back the tomb stones. We cannot stay in the United Kingdom. It is not united anymore. Those who told us we had the same values and concerns as people throughout the rest of the country lied – or worse still, they were incompetent. Now, our future is dependent on the leaders of Europe. Please help us stay. Angela Merkel, please help Scotland, help us work together for a united, free and strong Europe. We have made our democratic will clear, we want to work with you and your colleagues. The Orcadian – Number 1 for Jobs in Orkney See this week’s edition of The Orcadian for over thirty job listings. View situations vacant online. The post Over 30 jobs advertised in this week’s edition of The Orcadian appeared first on The Orcadian Online. There’s plenty to see and do in Orkney this weekend. Check out our website to find out more! The post Whit’s on this weekend? appeared first on The Orcadian Online.